In 1814, rule over Norway passed from Denmark to Sweden, ending 434 years of Danish-Norwegian union. Some Norwegian elites resisted the imposition of Stockholm’s authority, but by the end of the year the Swedes had established control of the country. They promised to respect Norway’s separate constitution; union with Sweden would be a personal one, with a common king and direction of foreign affairs. During the second half of the 19th century, Norway saw its economy become ever more dependent on its shipping industry. While Sweden followed protectionist policies to shield its native industries, particularly steel, Norwegian business interests clamored for free trade. In 1884, tension led to new laws allowing the Norwegian parliament to fire cabinet ministers, but this did not solve the underlying problem. Swedish embassies and consulates around the world were not, Norwegian shipowners complained, supporting their interests and often worked against them. In 1895 the Swedes ended free trade even between the two countries, and tensions grew hotter. Norway maintained its own separate army and navy, and began steady increases in both. Sweden armed as well, and war seemed imminent. In May 1905, the Norwegian parliament passed a law establishing its own foreign service, which King Oscar II vetoed. Norway mobilized and armed the frontier forts; on 7 June parliament made a formal declaration of independence. After declaring their own mobilization, the Swedes soon agreed to await the outcome of a Norwegian vote on independence. By 368,208 to 184 the motion carried. While many of his advisors spoke for war, Oscar declined to fight. Sweden formally recognized Norway’s independence in October. As part of their militarization, Norway ordered a division of coastal battleships similar to those operated by Sweden. A minor arms race broke out between the two nations; a number of Swedish industrialists even complained that Norway was ordering her ships in Britain rather than Sweden. Tordenskjold on a visit to Kiel, 1900. Armstrong-Whitworth laid down two small coastal battleships in 1896, Harald Haarfagre and Tordenskjold; even the names (Swede-smiting Norwegian heroes of the Viking and latter Danish periods, repsectively) were a provocation. They displaced 3,858 tons each and carried a single 8.2-inch gun in a turret fore and aft plus a half-dozen 4.7-inch guns. They made about average speed for battleships of the time (17 knots) and adequately armored for their role. They were superior ships to the Swedish Svea class then completing; the Swedes responded with a new class of their own, three ships of the Oden class. Not to be intimidated, the Norwegians ordered two more slightly larger but similar ships, Norge and Eidsvold. These had a slightly heavier secondary armament, with 5.9-inch rather than 4.7-inch guns, and displaced 4,165 tons. The two new ships commissioned in 1900; the Swedish Navy Minister asked for one more ship in reply but right-wing elements in the parliament’s First Chamber rammed through an appropriation for four of them. Norwegian naval construction halted for the next several years with Swedish acceptance of independence. In 1912 parliament voted to fund a pair of larger coastal battleships, the 4,900-ton Nidaros and Bjørgvin. Elswick, Armstrong’s rival, received the contract (British firms sometimes competed for arms contracts, but more often this was a public show to promote sales). The two ships were laid down in January 1913 and confiscated by the Royal Navy in 1915. The British completed them as the monitors Gorgon and Glatton. In Norwegian service, their main armament would have been two 9.4-inch guns, plus four 6-inch guns. They were slower than the previous Norwegian ships, rated at only 15 knots. The British kept the armament basically unchanged (substituting 9.2-inch Mark XII guns for the Norwegian big guns) but added wide anti-torpedo bulges that increased displacement to 5,700 tons. Gorgon, the former Nidaros, was commissioned in May 1918 and performed several bombardments of the Flanders coast. After the war the Royal Navy tried unsuccessfully to sell her back to Norway and to Peru, Romania and Argentina before using her as a target. Glatton, the former Bjørgvin, was commissioned in September 1918 and blew up at her moorings a week later when red-hot cinders heated a bulkhead between the engine room and her 6-inch magazine. During the First World War, the Norwegian fleet performed neutrality patrols, swept hundreds of mines that drifted into Norwegian waters, and recovered over 200 bodies. The coastal battleships saw no action, and Norway remained neutral throughout despite growing public hostility toward German unrestricted submarine warfare. Harald Haarfagre and Tordenskjold became training vessels in the 1930s, and were captured undamaged at the Horten naval yard by the Germans in 1940. Both were converted to floating anti-aircraft batteries by the Germans and saw much more action in the Second World War in this role; they were returned to Norway afterward and scrapped. Norge and Eidsvold were both at Narvik on 9 April 1940 when German destroyers entered the fjord. 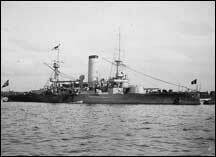 The Norwegian ships challenged them; the Germans replied with torpedoes that sank both. All six Norwegian coastal battleships, plus the fleet’s small collection of gunboats and torpedo boats, appear in our Great War at Sea: Jutland game. Norway did not fight in the First World War, but there are scenarios in the game based on Norwegian, British and German war plans, and also for the 1905 potential conflict with Sweden. Our Jutland: Battle Analysis has more scenarios, covering British violations of Norwegian neutrality in 1914. Any proud Norwegian gamer will now be able to chase the Swedes. 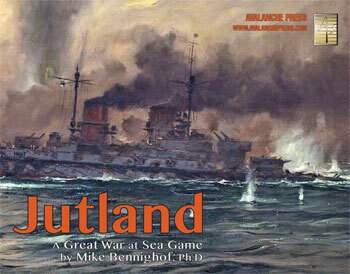 Click here to order Great War at Sea: Jutland!